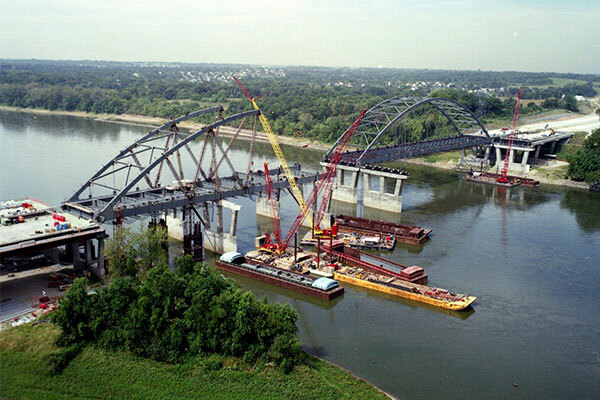 Kraemer constructed twin 17-span bridges across the Missouri River as part of the Page Avenue Extension project that relieved congestion on I-70 in St. Louis, Missouri. Kraemer constructed two, 600-foot-long tied arches for the main bridge spans; to expedite construction, each tied arch was floated into place above the Missouri River’s navigational channel on a custom-designed falsework tower. Work also included the construction of concrete decks and approaches. The superstructure included 10 spans of pre-stressed concrete girders, six spans of steel plate girders, and the tied arches. The completed bridge spans approximately 3,200 feet.